Mark Smith Custom Homes. Turning your dreams into a living masterpiece. The Normandy Estates gated community at Spring Creek Parkway and Tennyson Road spans 75 acres of heavily wooded creek-lined estate and patio home lots adjoining a serene lake with fishing dock. 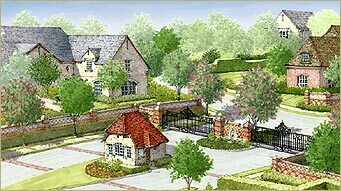 Situated in the award-winning Plano ISD, three neighborhoods offer a range of living options including 52 estate lots which are sized from 15,000 sq feet to 36,000 sq feet, with home prices from $1,600,000 +. An additional 49 villa home lots will range from $900,000 and up. Mark Smith Custom Homes is currently taking reservations for building this fall in Normandy Estates. Please call for more details. Newman Village is a gated master-planned community in Frisco featuring a unique blend of home styles on oversized home sites. Upon entering Newman Village, you are greeted by a guardhouse and enter into a beautiful, lush landscaped neighborhood. Mature trees, a series of walking paths and exercise trails throughout the community make this a great place to build your dream home. Located just off the Dallas North Tollway, Newman Village is ideal for commuters with easy access to highways, DFW Airport, sports, shopping and entertainment. Art lovers will appreciate that Newman Village was designed to feature works of art in public spaces throughout the community.